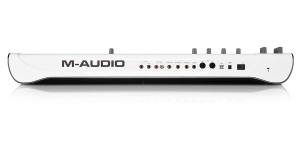 Audio offers 12 virtual analog voices with the widest possible variety of digital processing. You can simulate the sound with 3 low-frequency oscillators, amplitude modulator, arpeggiator, such effects as echo, delay, chorus and distortion, deforming the signal, making the samples of old analog synthesizers sound even grainier and more poisonous. The fragments, especially drums, bass and multi patches, initially have a peculiar, industrial sound. It should be noted that the filter (12 and 24 dB, low, high and bandpass) also has a stage of tube saturation, which represents another opportunity to work on signal distortion. Venom has 3 envelope generators and 16 modulation routes. Multitimbrality is limited to 4 parts, for each of which you can apply one effect. The bit decimation and reduction functions are available. The Venom has a built-in audio interface and can act as an effect processor for an external sound source. 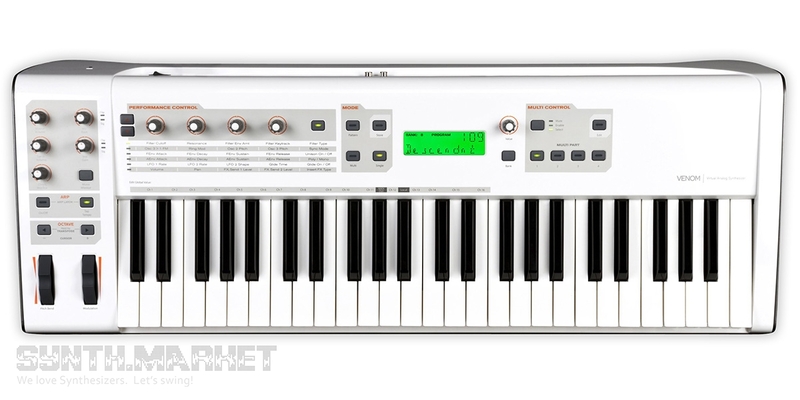 The synthesizer is smoothly compatible with ProTools and Ableton Live, and perfectly manages iPad and iPhone applications. 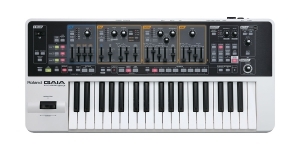 The manufacturer's desire to economize making his first synthesizer led to the fact that only the main encoders were laid out on the front panel, and the full list of functions is available only through the Vyzex Venom Editor. 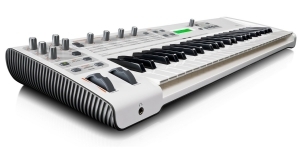 On the one hand, it gives complete control over the synthesizer, and on the other hand, limits the possibilities of its use during complex live performances. 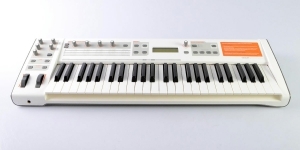 The quality of the keyboard survives no brutal criticism - this is the level of a cheap MIDI controller with an artificial "spring" press without aftertouch. Only the most basic information is displayed on the screen. 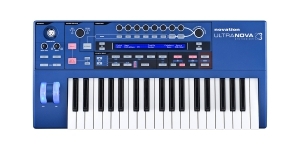 It's a pity that this interesting instrument is discontinued and doesn’t have a successor in M-Audio products line, and the genius Taiho Yamada left hardware opting for software development. There are 4 issues which could be solved (more controllers, better keyboard, more detailed display, fix the software bugs). That would make Venom highly competitive on the market. 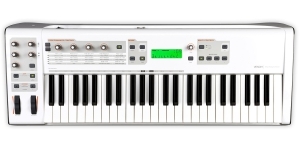 Vocoder, Synthesizer, Digital (D), Virtual Analog (VA), Voices: 18, Monotimbral, Velocity Sensitivity, Number of Keys: 37, Size: 3, Production start: 2011. Taiho Yamada is a sound engineer and he always knows how to impress. He developed the sound engine for M-Audio Venom, worked with Alesis (Andromeda A6, Quadrasynth and QS series). He kept silence since Venom happened to be underrated and when some work on software synths was finished. But NAMM 2017 revealed the name of Yamada’s own brand – MOK. Together with Alesis MOK has prepared a futuristic sound concept and we’re going to tell you a little bit about it.